The win was unexpected, and Solih’s supporters flooded the streets, hugging one another, waving the Maldivian flag, cheering and honking horns in celebration. Male: Opposition candidate Ibrahim Mohamed Solih declared victory early Monday in the Maldives’ presidential election widely seen as a referendum on the island nation’s young democracy. The win was unexpected, and Solih’s supporters flooded the streets, hugging one another, waving the Maldivian flag, cheering and honking horns in celebration. The opposition had feared the election would be rigged for strongman President Yameen Abdul Gayoom, whose first term was marked by a crackdown on political rivals, courts and the media. Yameen did not concede, and his campaign couldn’t be reached for comment. “People were not expecting this result. Despite the repressive environment, the people have spoken their minds,” said Ahmed Tholal, a former member of the Human Rights Commission of the Maldives and a project coordinator at the nonprofit watchdog Transparency Maldives. Solih, 56, was a democracy activist during decades of autocratic rule and a former Parliament majority leader. He became the Maldivian Democratic Party’s presidential candidate after its other top figures were jailed or exiled by Yameen’s government. Famed for its sandy white beaches and luxury resorts, the nation of islands and atolls in the southern Indian Ocean has seen economic growth and longer life expectancy under Yameen, according to the World Bank. But democratic freedoms have been curtailed. Solih campaigned door to door, promising at rallies to promote human rights and the rule of law, a message that resonated with voters who saw signs the Maldives were slipping back to autocratic rule, just a decade after achieving democracy. “Ibu is totally different from Yameen, because Yameen is a dictator and a brutal person. Ibu is a very mild person who listens to everyone,” said Ahamed Fiasal, a 39-year-old IT business owner, using Solih’s nickname. But Solih had 58.3 percent of the vote with nearly 97.5 percent of ballots counted early Monday, according to independent news website mihaaru.com. A spokesman for Maldives’ Election Commission said official results would not be announced until Saturday, allowing a week for parties to challenge the results in court. 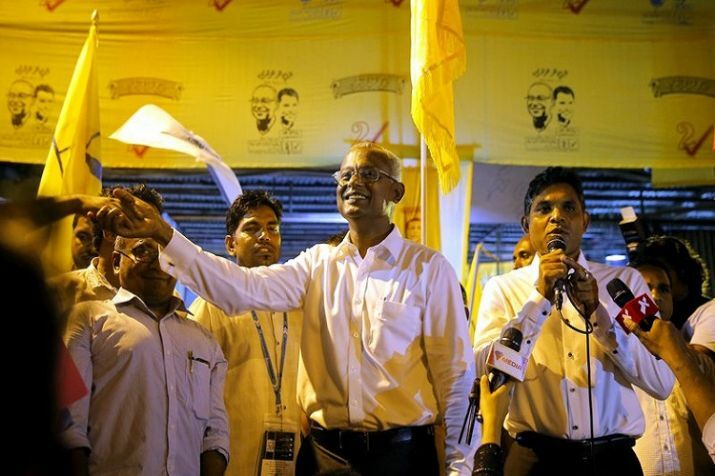 Solih, surrounded by thousands of his supporters in the capital city of Male, urged calm until the commission had announced the results. In his victory speech, Solih called the election results “a moment of happiness, hope and history,” but said that he did not think the election process had been transparent. A police raid on Solih’s main campaign office the night before the election was seen as a worrying sign that Yameen would “muzzle his way” to re-election, according to Hamid Abdul Gafoor, an opposition spokesman and former Maldives lawmaker now based in Colombo, Sri Lanka. The European Union had said that it was not sending election observers because the Maldives had failed to meet the basic conditions for monitoring. The U.S. had threatened to sanction Maldivian officials if the elections were not free and fair. Few foreign media organizations were allowed into the country to cover the election. Yameen used his first term to consolidate power, jailing opponents, including his half brother, a former president, and two Supreme Court Justices. In February, Yameen declared a state of emergency, suspended the constitution and ordered troops to storm the Supreme Court and arrest judges after they had ordered the release and retrial of those jailed after politically motivated trials. Despite the turmoil, voters flocked to the polls on Sunday, standing in long lines in rain and high temperatures to cast ballots. More than 260,000 of the Maldives’ 400,000 people were eligible, and voters also stood in long lines in Malaysia, the U.K., India and Sri Lanka, where the opposition had encouraged overseas Maldivians to participate. Meanwhile. the US on Sunday congratulated the people of Maldives on the peaceful conclusion of elections in their country and urged "calm and respect for the will of the people" as the process concludes. "The United States congratulates the people of Maldives, who peacefully raised their democratic voices to determine the future of their country," State Department Spokesperson Heather Nauert said. "Although the Election Commission has not yet announced the final tally, we note Maldives' media and NGO reports that the Joint Opposition candidate has secured a victory following a peaceful day of polling," she added. "We urge calm and respect for the will of the people as the election process concludes," Nauert said.